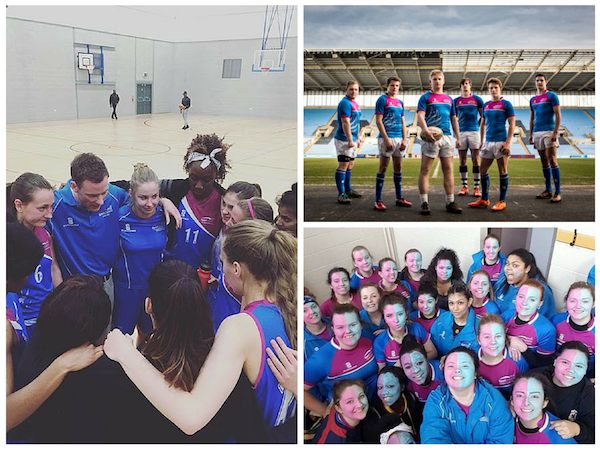 “Trophies gather dust, but memories never fade.” Coventry University Students’ Union Sport & Wellbeing Officer Alexa Thiel shares her thoughts on this year’s thrilling Varsity event. Now the dust has settled and the reality of just how close our teams came to securing our first ever Varsity title has set in, it’s time to take a look back at the highs, lows and the down right hilariousness of your support! Varsity kicked off in familiar style with the Ice Hockey opener as CU came out on top 14-9 in front of a packed crowd at the SkyDome. UoW staged a late fight back but it wasn’t enough as CU claimed the first points of this year’s event. And of course, you all turned up in sheer numbers and colours! …a stunning come back in the Women’s football, who overturned a 3-0 deficit to win 4-3, including this absolute worldie! …and neither could the Men’s Football Team, who where in usual buoyant mood! …but, despite leading the points scoring going in to the penultimate day, Varsity came to a close at the Ricoh Arena with the Men’s Rugby Union clash, which ended in a disappointing 22-20 last minute defeat. Also, special kudos has to go to our men’s team, who donned the rainbow jerseys to mark the end of LGBT History Month. CURFC lose with the final play of the match 22-20. Great effort from all the boys, but absolutely devastating. So disappointing to see Coventry lose in the dying seconds to Warwick but a class end to Varsity this year! On this occasion, Warwick were victorious. However, let us not be disheartened as the Coventry side featured some incredible performances. Pool and Ice Hockey gave us some of our very first victories. Rugby League amounted an enormous 54-0 win, while Netball and Equestrian lead from the very start and brought the win and the rosettes home respectively. We saw a similar story with Women’s Tennis who outperformed the Warwick side and from Cricket who came back from defeat last year to take the deserved win in 2016. Men’s Basketball won once more and Men’s Swimming continued to rack up the points, picking up some PBs along the way. Karting took all three podium positions; 1st, 2nd and 3rd! Not forgetting Women’s Football who came back from a 3-0 deficit to win 4-3, and Men’s Football who put on a cracking show and made it 3-0 at full time. However, our pride is not only with the winning sides. Women’s Basketball brought it back from a deficit of 10 points to lose by only two in the final seconds. A similar story for both Men’s and Women’s Volleyball who came so incredibly close to clinching their first varsity wins only to be edged out at the last minute. The same could be said for Women’s Rugby Union, who were one second and one decision away from their first varsity win. On their president’s birthday, Golf lost my a mere half point on the final putt, while Ultimate Frisbee competed for points for the first time and put a valiant effort in. Our respect should also be given to Athletics, many of whom competed in the Park Run despite running in the marathon the next day. I am proud of and thankful to each and every competitor on the Coventry side! Of course, perhaps the most prominent near miss was from CURFC. Rugby Union were mere seconds away from stealing the final points following their best performance this season. Disappointed, the team turned to the crowd – to see they were on their feet, louder than the opposing fans, showing their thanks to the players; and that’s what it’s all about. Respect for one another. When I took to Facebook to put out a plea for futsal players to avoid the forfeit of the fixture, I never expected the response I received; we put out a squad of willing volunteers from Hockey, Tennis and Netball. It’s goes to show that, at Coventry, we team together to support one another. Did someone say ‪#‎oneteamonedream‬? Varsity 2016 saw many changes in format and descriptors for inclusion, and perhaps, had we buckled to Warwick’s demands and accepted a further reduced schedule of events, we might have won. But for me, that’s not what it’s about; it’s about our students, our competitors, their experience and our spirit. In a competition that spanned 11 days, we held the lead for 9; the longest period in varsity’s 26 year history; a feat we should all be proud of. I certainly am.